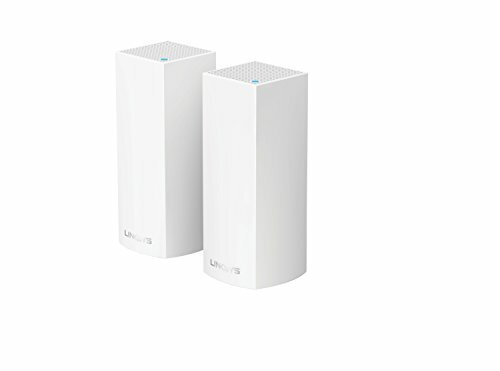 Linksys Velop is a powerful Wi-Fi mesh solution that links up even the biggest of homes. As one of the oldest and most established networking hardware suppliers, it should be no-brainer that Linksys would not only enter but excel in Wi-Fi mesh. It is no surprise, therefore, that Linksys's new Velop only comes close to Netgear's Orbi and Portal in pure performance and range. But the company's networking expertise shows up in Velop's easy set-up and in its expansive app networking controls and features, which both Orbi and Portal lack. These varying attributes should make Velop the most versatile, best all-around of the top high-performing Wi-Fi mesh systems—except its network doesn't always act predictably. And also not surprising, as a high-performance system, Velop isn't cheap. A Velop two-pack, which will supply Wi-Fi up to 4,000 square feet, will run you $349.99, priced between the more expensive Orbi and the less expensive Portal, which covers more territory for less money; a Velop three-pack, rated to cover up to 6,000 square feet, costs $499.99, an area two Portals can cover for around $200 less, and a Velop single is priced at $199.99. Velop's 7-inch tall, 2.5-inch wide white rectangular columns are half the size of the Orbis and, to my aesthetic eyes, could be mistaken for any number of other types decorations and therefore aesthetically blend more seamlessly in a room than its more obvious, if smaller, competitors. Because it's a tower, Velop also takes up less shelf space than the flat Portal. To help hide the cabling and cords, the bottom of the Velops are hollowed out, with the power and, if necessary, Ethernet jacks plugged into the top of the resulting recess; cables are then funneled through a corner cutout on the rear bottom. You'll find just two Ethernet jacks in each Velop rather than the four found on the Orbi and Portal, but two should be plenty for most users. What's surprisingly missing is a USB jack to connect a networked printer or hard drive. There's a comforting but tiny status LED on top of each Velop that won't be distracting or annoying in the dark, such as in a bedroom. 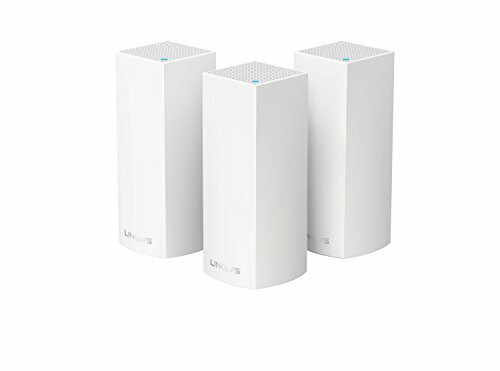 Unlike all the other mesh systems other than Luma, you happily do not have to first unplug your cable modem to connect Velop to your system, eliminating not only one of my least favorite set-up aspects of these mesh systems but also saving the time the cable modem needs to reboot. This also means you don't have to wait until your network isn't being used—like in the middle of the night—to install it, as you do with most of the other mesh systems that need you to first unplug your cable modem. Also unlike most systems, you have to create a separate Linksys account before you can create a name and password for your system. In order to both create your account and later connect to Linksys' app and its features you'll have to connect to Linksys' cloud. It took me three annoying tries to successfully connect during set-up and, during usage one day, the Linksys cloud was inexplicably and annoyingly unavailable for several hours. There are no printed instructions; you simply download the Linksys app—it's not called "Velop"—and follow the illustrated step-by-step. The app even asks what kind of modem you'll be connecting the Velop to, to make sure you're following the right set-up process, and also asks where in your abode you're placing your initial Velop. There's an odd on/off switch next to the recessed jacks whose purpose I'm unsure of, but its default is "on" so you don't have to worry about it. When setting up a second Velop, you're asked again where in your home it's being placed. All you do is plug the second Velop into power, and the mesh creation process is mostly automatic and seamless. Knowing where the Velops are located helps the system configure itself the best way to deliver optimum speed and performance, regardless of where in your home you are. The Linksys web site says you can ask Amazon Echo's Alexa to turn on your Velop guest network and get your network password, but I could find nothing in the app to set Alexa up or use it. As noted, Velop was one of the top performing Wi-Fi mesh systems, ranking just behind Orbi and Portal, delivering between 175-190Mbps from my 300Mbps service, which means you'll get top performance from any lower subscription such a 100 or 50Mbps (the Velop app's own speed test told me I had 352Mbps available). More practically, a 3GB video downloaded to my MacBook Pro in less than 11 minutes, lagging behind, again, only Orbi and Portal. But neither Orbi nor Portal offer the range of networking or control features found in the Linksys app, although I kept running into trouble. For instance, it takes a few seconds for the app to connect to the Linksys cloud to get whatever information it seems to need. Once connected, the features menu is well-organized, except I once found myself trapped in some weird navigation loop that was solved only when I closed the app and rebooted it. Velop allows you to set Device Prioritization for up to three devices, which ensures the Velop delivers the best connection to your most important devices. This prioritization comes in particularly handy if you make your media streamer the top Velop priority, which minimizes streaming buffering when you're simultaneously surfing the net on a laptop or tablet. 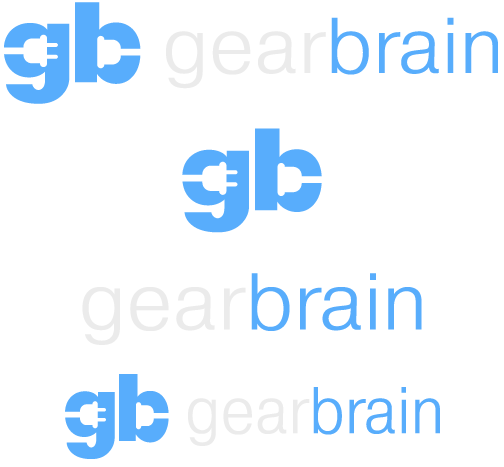 Other non-prioritized devices on your network then share whatever spectrum is left. Velop's already excellent tri-band performance could soon be boosted when Linksys adds access to the nearly vacant DFS bands accessible thus far only on the Portal. When this DFS firmware update will be available hasn't yet been announced at this writing. You also can create a guest network, but be aware that when you create, turn on or turn off this guest network, your Velop system will then reboot, which takes a minute or so. But, on a couple of occasions, when I activated the guest network, I inexplicably got kicked off the whole Velop network, shifted to one of the other half dozen networks I've got set up. Velop's parental controls lack the time schedule restrictions available on the eero. Instead, Velop lets you block specific sites or, if you see your offspring—or anyone on your network—surfing a forbidden site, you can instantly block the connection to that specific device. 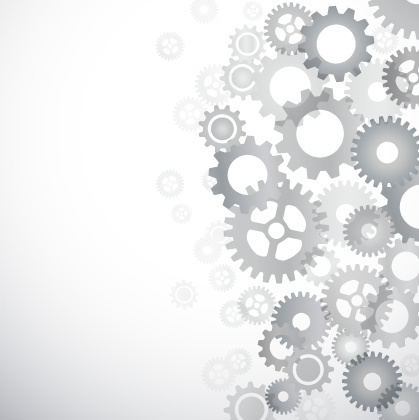 There also are a handful of advanced features for the more network management proficient. A high and flexible Wi-Fi mesh performer for most large households, Velop does nearly everything as well or better than the slightly higher-performing Orbi or Portal for less money than the former but more than the rangier latter. But perhaps more importantly, Velop offers a wider variety of features than its two primary competitors, which isn't hard since neither offers any, plus you get a generous three-year warranty and three years of free tech support. But Velop's expansive feature set and easy set-up is mitigated somewhat by the network's occasional connection hiccups, both its app connection to the Linksys cloud and occasional network drops, as well as its lack of a networked USB jack. Also, I prefer eero's time-centric parental controls over Velop's site-centric approach—I wish someone would combine them since both are handy to have—but each household needs to decide which approach is preferable. Overall, Velop is recommended for expansive homes of between 2,000 and 4,000 square feet, with kids whose surfing needs to be monitored, with heavy, simultaneous internet usage, and especially if you're a bit tech phobic. But I hope Linksys can solve its minor but periodically annoying connection hiccups.